Since the Jeep Renegade’s release in 2015, there have been an overwhelming number of positive reviews about its style, capabilities and fuel economy. Now in its third model year, the 2018 Jeep Renegade has more features than ever and that gives buyers and lessees plenty of ways to get a Jeep Renegade that suits their lifestyle and is within their budget. Looking to learn more about the 2018 Jeep Renegade? You’ve come to the right place. The 2018 Jeep Renegade lineup consists of four trim levels, the Renegade Sport, Renegade Latitude, Renegade Limited and Renegade Trailhawk. With the exception of the Renegade Trailhawk, a trim that is only available with four-wheel-drive (4WD), the Renegade Latitude, Renegade Limited and Renegade Sport are all available with two-wheel-drive (2WD) or 4WD. There are two engine options on the 2018 Renegade lineup. There is the 1.4-liter 4-cylinder engine and the 2.4-liter 4-cylinder engine. The 1.4L 4-cylinder engine produces 160 horsepower and 184 lb-ft of torque and it has a fuel economy of 22 mpg in the city and 30 mpg on the highway. The 2.4L 4-cylinder engine produces 180 horsepower and 175 lb-ft of torque and it has a fuel economy of 21 mpg in the city and 29 mpg on the highway. The interior styling of the 2017 Jeep Renegade offers driver’s the rugged jeep look while maintaining some sleek and style. The base trim, the Renegade Sport, has plenty of convenient interior features. Standard features on the Renegade Sport include, manual 6-way driver seat and 4-way pass seat, Rear 60/40 folding seat, Driver assist handle, Auxiliary 12-volt front and rear outlet and Cluster 3.5-inch Monochrome display. For those looking to upgrade, the Jeep Renegade Limited trim offers some exceptional features. Standard equipped features in the Renegade Limited include, 40/20/40 rear seat with trunk pass-thru, heated front seats, leather trimmed bucket seats, power 8 way driver seat and manual 4-way pass seat, cluster 7.0-inch color display, and a heated steering wheel. The exterior of the Jeep Renegade has a unique style while still offering drivers the Jeep feel. The base trim, the Renegade Sport comes standard equipped with 16-inch x 6.5-inch styled steel wheels, 215/65R16 All-season tires which is also standard on the Latitude trim, and a tire service kit – which comes standard on all trims. The Renegade Altitude and Limited trims come standard equipped with 225/55R18 All season tires. Additionally, All four Renegade Trims offer Rear window defroster, Rear window wiper/washer, and variable intermittent windshield wipers. Other trims like the Renegade Trailhawk or the Renegade Limited have some upgraded standard features that are available options on other Renegade trims. Some of the available upgrade features include, leather seats, leather-wrapped steering wheel and shift knob. The optional exterior features include, larger wheels (17-inch and 18-inch), My Sky Fixed/Removable panels, fog lamps, and power heated mirrors. For the 2018 model year, Jeep added some new tech features to the Renegade lineup and they enhance the vehicle’s entertainment and overall safety. Standard safety features on the base trim include, electronic park brake, stability control, occupant detection system, speed sensitive power locks, and tire pressure monitoring display. In addition, optional safety features include, passive entry/keyless go, remote start system, speed control and speed sensitive power locks. The entertainment features in the Jeep Renegade don’t disappoint as far as convenience and technology. 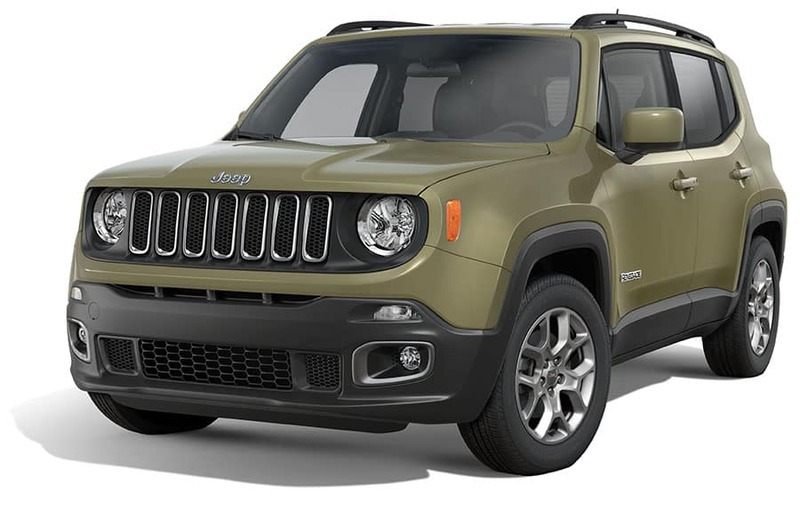 The base Renegade Sport trim comes standard equipped with 4 speakers, Media hub and Radio 3.0.The Jeep Renegade Sport is the only trim that has the option of a 5-inch Uconnect system paired with satellite and back up camera – not available in any other trim. Moving up the trim levels, the Renegade Latitude, Altitude and Limited are standard equipped with a 5.0-inch touchscreen display with Uconnect system, Integrated voice command with bluetooth, 6 speakers, and 1 year subscription for SiriusXM radio. Furthermore, some optional features include HD radio, Uconnect 6.5 Nav and Uconnect Access. Price for the base trim level sport starts at $17,995 (plus destination fee). Also, the Renegade is backed by a three-year or 36,000-mile limited basic warranty and a five-year or 60,000-mile limited powertrain warranty. Hollywood Chrysler Jeep is located just outside of Miami, and we have a great selection of Chrysler and Jeep vehicles. Visit us at Hollywood Chrysler Jeep for a test drive of the brand new Jeep Renegade today.